Galley Wench Tales: Tiny Tahiti Rental Car: $90?!? Our Tahiti car rental; like a real car, only smaller. 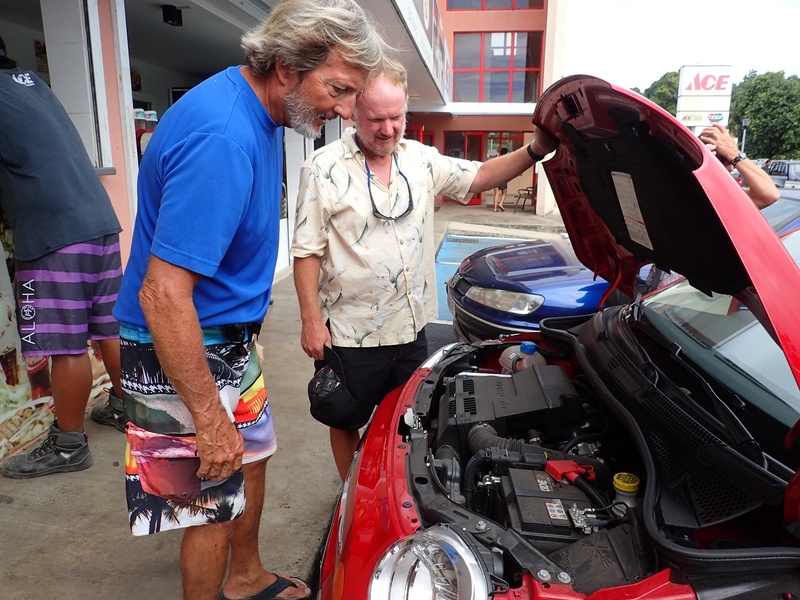 'Twas our last good day to blitz Tahiti; we'd decided to share a car rental with our cruising friends Steve and Patty of Armagh. 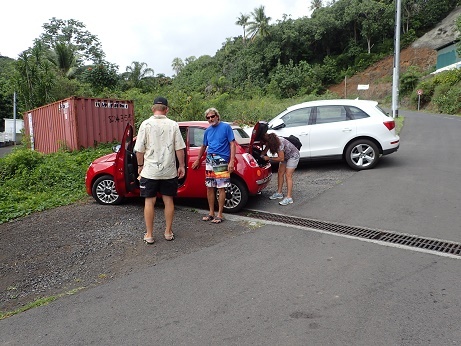 The rental flyer noted car rentals were $55/day. The story when we called was different. “It's all we have left; $90, returned by 5 pm, whether you get it tonight or tomorrow. Someone else is it waiting for it. The flyer? Oh, that's an old one.... And this? It's a sports car' a convertible.... A discount for a 23 hour rental?! ?” The EcoScooter agent smiled broadly, and chuckled. Bargaining is not part of the Polynesian culture, unless you consider “take it or leave it” bargaining. Fiat engine of our EcoScooter of Tahiti rental car. Sports car or not, the car was SMALL. But peppy. While Patty's and my knees rested uncomfortably behind our ears for the ride, its gutsy motor was eager, akin to using a John Deere combine to mow a standard postage-sized suburban lot. Fortunately, it was also far more nimble, to Wayne's driving delight. Given that it poured, we didn't bother to try to take advantage of the car's convertible features. We rushed to return by 5. A different agent met us; he wasn't even expecting the car. Eventually, he checked us out. He was there to check in another car. “Do I get my t-shirt?” Wayne waggishly asked. This agent, too, grinned, and mimed the removal of his shirt off his rather ample body. Wayne didn't get his t-shirt, or his discount. As for me, I appreciate and respect the straightforward Polynesian approach, even when it doesn't get me what I want.